Concerning Mortality – ACRONYM Inc.
On Labor Day, we were driving to meet some friends for a backyard BBQ, when we witnessed a pretty insane accident. While I’ve been in one minor accident in High School (we skidded into a ditch, no one was hurt, and we still made it to class on time), and I’ve known people who were in pretty severe accidents, I’ve never witnessed one happening except in a movie. It instantly made me realize – simultaneously – how desensitized I am to seeing them, and how completely blindsided I was by the event, emotionally. The official news report is so boring as to make it seem completely inconsequential, so for the record, here is my account. We were heading south on I-205 at about 4:30 PM. We had some music on, and we were chatting about absolutely nothing of any importance. Suddenly, at about where 205 crosses Division, an airborn truck from the northbound lane flipped over the median, landed, and began rolling on the left-side shoulder. We were in the right lane, and by the time we fully processed what was going on, we were already past it. We immediately pulled over to the right shoulder, along with most everyone else going southbound. From our perspective, this looked like a fatal accident. There was no way to know for sure without getting out of the car and investigating, and a number of other drivers were doing just that. Part of me felt instantly awful, not just because I assumed that the people in the truck were dead, but because I was not among the people who lept out of their cars and ran to try and assist. I immediately rationalized this by telling myself that there was nothing that I could have done; the accident had already happened, you can’t help people who are dead, and I have no training in First Aid or CPR, let alone the strength to lift heavy things. Once we had confirmed that we were both okay, and managed to catch our breath, we slowly continued south, to go to the BBQ. We were both stunned later to find out that, according to the report, there were no fatalities. But now I feel even worse about what happend, in that there were people who needed help, and instead I went and drank whiskey with my friends and ate some extremely delicious sausages. It was one of those moments where I was cursing the person that failed to exhibit simple signs of humanity, only to find that I was that person. While I know that, realistically, if we had stuck around to try and help, we would have just been gawkers who were getting in the way of people who could genuinely do something important. Intellectually, there is no reason to feel bad. There were a number of people who instantly offered assistance, and before we could get to the BBQ, there were a number of ambulances and other vehicles already responding to the accident. People who were trained and skilled professionals who would actually do something helpful were going to help. We, unfortunately, were not. A couple of months ago, a friend and co-worker of mine died in a car accident. I say friend, but really she was more or an acquaintance. I had played cards with her a few times, she dated a good friend of mine, and I saw her every day at work. We weren’t super close, but we didn’t have to be. I was absolutely floored when I found out about her death, and while the circumstances were completely different from the accident we witnessed, I can’t help but see some sort of connection. In both cases, the accidents were completely unnecessary, and yet the both affected me. And yet, I was not the one even secondarily involved. I have never been particularly fond of vehicles. I’m a 37 year old man who does not know how to drive. I’ve always been a little frightened of how dangerous large cars are, and as someone who lives on a well-traveled corner where there are almost accidents every few minutes, I feel very strongly about my vehicular discomfort. But this distaste is not practical in the least bit. I need to be able to travel, and since we have yet to master magic or teleportation, very fast vehicles seem to be the solution. Part of me wants to say that these accidents could entirely be eliminated if people were more perceptive regarding the world around them, and there is truth in that, undoubtedly. But would I do any better were I the driver? Perhaps not. The world around us is what it is, and no matter what kind of horrific accidents do happen, being more perceptive just means that we will see them more clearly when they happen. I can’t allow myself to become paralyzed by accidents, nor can I allow myself to become complecent, either. 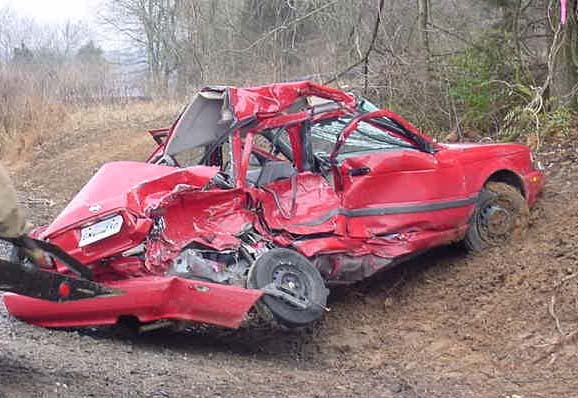 But the image of that accident terrifies me, not only because it happened in front of me, but because every time I remember it I am reminded of my friend who is no longer with us. When we went back home later that night, we took 205 North, only to see that the accident was entirely cleaned up. There were three cars involved in the accident (two of them stayed on the northbound side), and all that remained in terms of signs that there had been an accident were the usual barrier damage, and small bits and pieces on the road. At that moment, it looked like the accident could have happened says, or even a week prior. In our lives, we are so quick to try and put things out of our heads. We want to get to a healthy place, a happy place, and a place that is better for our well-being, and put out of our minds these kinds of things that we witness. Already, elements that seemed vivid and terrifying have become fuzzy and incomplete. In another month or so, I’ll probably think of this incident rarely. This is how we cope with the thought of mortality, and how we prevent ourselves from becoming terrified recluses who never leave the house. Still, it seems like one of those experiences where there is a less obvious lesson to be learned, about the human condition, and who we are as people, and how we should behave and how we should move forward in a positive and more productive way. I feel like there should be some great epiphany here, that I can share some kind of wisdom with you about how I grew as a person, and what I can share with you in my growth. But this time, I can’t. All I have for you is a story about how I witnessed an accident, how I’m thankful that my friends and family were not in it, and how I will probably be trying to make sense of it for longer than I originally thought. My hope is that those involved know that I really do care, and that I wish for them the best in however the future turns out. Indeed. There is that careful balance we’re all trying to find, between being aware of the world around us, and avoiding being horrified by the realities of what we do each and every day. There is a point where anything, and everything, could lead to a horrible accident. The best you can do is tell the people you love that they are important to you, and live your life as best you can, every day. And drink coffee. Lots and lots of coffee.